This amp is the result of a joint venture from PE and Dual who were very famous for their turntables (remember the Dual 1009 and 1019). As both were also famous for the low price market it may not surprise that this amp does not have an input for MM pick ups (ceramic only). But: This amp is not bad at all. The iron quality is fine and seems to be supplied from a third party (looks like Telefunken or Telewatt). 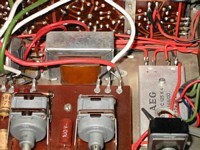 And: This is the only one of all vintage stereo amps from Germany that uses a choke in the power supply. to obtain a linear frequency response. 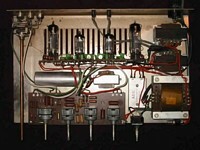 My unit is in nice original condition and delivers 7.1 watts per channel from the original Lorenz ECLL800 and Valvo ECC808 tubes with very low hum and noise. The OPT has only a 4 Ohms tap, but it also works and sounds well on 8 Ohms loads. The volume pot is not perfect in the lower range, but this can be compensated by the balance control.